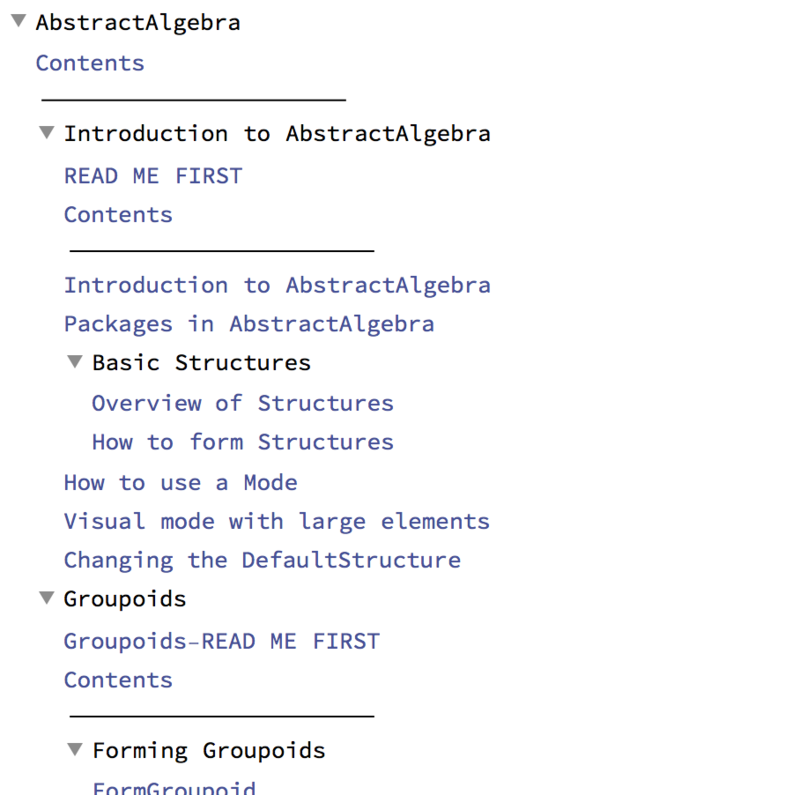 The package Exploring Abstract Algebra with Mathematica works fine in Mathematica 10.4. After installing it in the $UserBaseDirectory it neatly shows up under Add-Ons and Packages in the Documentation Center. But this is no longer the case in version 11.1.0, although the package itself seems to work fine. Has anything been changed in the Documentation Center ( it certainly looks that way ), is there a simple fix for this issue? The Documentation Center was completely changed in version 6.0 to a search-based system from a table of contents based system. However, the old version 5 style Help Browser was still functional. It did not contain the Mathematica documentation, but it could be used to read the documentation of certain packages. Exploring Abstract Algebra uses this very old help browser system. Support for this old help browser was removed in version 11.0, as you can see e.g. here. Thus the documentation of this old package is no longer readable. The package needs a compatibility update. The good news is that you can still read the documentation notebooks as they are. What is missing is the table of contents, and partitioning the notebooks into small sections. It seems that the documentation structure is contained in the file BrowserCategories.m. I tried to write a very rudimentary program that will create a table of contents from it. There are very likely multiple issues with it, so you will want to improve it. But I think it will be a useful starting point. What is the complete list of valid FrontEnd Packet types? Documentation searches hang frequently: Anyone else dealing with this? How do I efficiently navigate the Documentation Center? How to make notebooks suitable for the Documentation Center? Is the documentation center broken?